I must have read most of this book with my eyes bugged out. It's just so hard to believe that these things happened, in our country, less than a hundred years ago. Some of the people who worked to build the atomic bombs used by the US against Japan in World War II are still alive to tell the story, and Denise Kiernan interviewed them and wrote a book about it. Some of the details these women recall are disturbing, to say the least. For one thing, most of the civilians (many of them young women) who were hired to work in the hastily-constructed town of Oak Ridge, Tennessee had no idea what they were doing. Oh, they were instructed in how to do their jobs, from sweeping floors to turning dials on machines to analyzing chemical samples, but almost no one knew their combined efforts would result in the first nuclear attack ever in history. The government officials in charge of The Project knew that secrecy was paramount and did everything they could to compartmentalize the work. Employees who asked too many questions or posed too many theories would disappear from their workstations. The girls learned to do their jobs and to keep quiet about them. And at the end of the war, they found out along with the rest of the world what exactly they had been a part of in the plants at Oak Ridge. I didn't know much about the Manhattan Project or nuclear fission in general before tackling this book. Kiernan anticipates this lack, and fills in the blanks with chapters detailing the development of the science of nuclear fission and the physicists who weaponized it. Her explanations are clear and concise enough for a layperson to grasp, without coming across as patronizing. Still, it's clear these sections are meant as a backdrop to the real story she's telling, which is about the lives of the women of Oak Ridge. And Kiernan tells all their stories—from that of a black woman who worked as a janitor and wasn't allowed to live with her own husband, to that of a chemist with a college degree who understood enough of what she saw to guess at the goal of The Project. There was a secretary from New York City who took dictation and typed memos, and a statistician who led a group of number-crunchers in data analysis. There were locals girls who had never left their home state of Tennessee, and women who came from far away at the promise of a good job and steady paycheck. Kiernan, clearly a deft interviewer, makes us feel we are truly getting to know each woman. And her point is clearly made: despite how little respect women were granted by the men in charge of The Project, without them President Truman wouldn't have had a big decision to make at all. 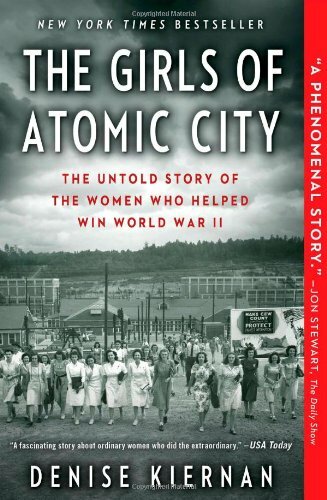 I wasn't sure that a book about the Manhattan Project that focused on people who didn't actually know much about it could be interesting—but the way I flew through the pages, particularly the last half, proved that it could. I found this topic so engaging, I'm keeping the party going by reading The Wives of Los Alamos by TaraShea Nesbit next. Nesbit's focus is also women involved with the Manhattan Project, but she tells the story of the wives of the scientists who built The Gadget in Los Alamos, New Mexico. You know how I love pairing complementary books together. You can find my recommendation for Nesbit's book here.